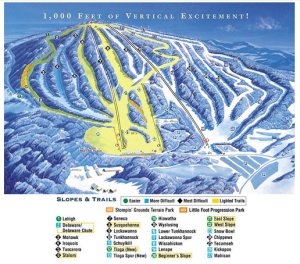 To many, Elk Mountain Ski Resort is the best that Pennsylvania has to offer. At about 1,000 feet, it rivals Blue Mountain Ski Resort for the highest vertical elevation in the state, but its bucolic location in the Endless Mountains makes for a quieter, more relaxed day out. It’s like a small Vermont mountain without the drive. Much of Elk Mountain PA is rated as black diamond terrain, though there’s nothing that will frighten an experienced East Coast skier. The best thrills are found on Tunkhannock (under the North Chair quad) and Susquehanna (off the East Chair double). The best intermediate terrain is found all the way to skiers left off the quad; the best beginners runs are the long winders all the way at the right of the mountain. Night lights illuminate about half of the mountain, so you can ski well into the evening and the snow will hold up except on the most busy or sunny days. The mountain is not renowned for its park or freestyle skiing (so not too many boarders! ), though there are a few glade entryways if the snow permits (the Elk Mountain ski patrol, unfortunately, does not!) and a large terrain park, The Stompin’ Grounds. The best bumps, some might say the best moguls of any ski resorts in PA, are found on Chipewa and Tunkhannock. Its isolated location means that Elk Mountain PA gets less crowded than many ski resorts in the Poconos. There are no high-speed chair lifts, which can add to the non-skiing time, but it also means less time standing in line at the bottom of the mountain. Although it still relies on snowmaking to function, an annual snowfall of about 80 inches means Elk Mountain Ski Resort has some of the best conditions in PA. The varied curves of the mountain give a variety of trail for a relatively small ski area (by non-PA standards). Elk Mountain PA Trail Map. Clickenzee to embiggen. Elk Mountain Ski Resort opened in 1959, making it one of the oldest ski areas in Pennsylvania. Its first chair lift was installed two years later, followed by the first snowmaking equipment in 1962. Night skiing arrived in 1966 and the last of the original tow bars was replaced by a chair lift in 1973. The 1980s saw an expansion of the base facilities, and the 1990s witnessed a large increase in skiable runs as Elk Mountain PA pushed and filled in its boundaries in both directions. The quad chair opened in 1994. This got me all excited for my ski wenkeed up at Steven’s in a couple weeks! Looks like you guys had an awesome time. More adults should take the time to make snowmen.